Sometimes, siding with the majority is best, but there are other times when you’re better off being in the minority. According to research from the Centers for Disease Control and Prevention, nearly 75% of American adults have some degree of gum, or periodontal, disease…that is not a majority you want to be counted among! 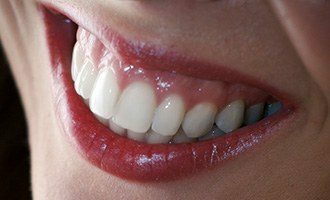 At South Shore Dental Care, we offer both thorough dental cleanings to help patients avoid gum disease entirely, as well as periodontal therapy for those who have this bacterial infection and need to keep the disease and its consequences in check. As mentioned above, gum disease is actually a bacterial infection. Millions of bacteria live and thrive in your mouth. When you drink plenty of water, eat a healthy diet, and brush and floss your teeth daily, these bacteria are kept under control. However, if the balance becomes unsettled, then these bacteria can multiply and begin to cause trouble. Specifically, bacteria hides in plaque, which is that colorless film that we all have on our teeth. With proper oral hygiene, this plaque is removed. However, if allowed to remain on and between your teeth, plaque begins to harden and becomes tartar. Tartar cannot be removed with just a toothbrush, and it begins to accumulate along and even below the gum line. Here, it can cause inflammation of the gum tissue and deteriorate the bone structure underneath the gums that hold your teeth in place. Ultimately, untreated periodontal disease can lead to tooth loss. In fact, advanced periodontal disease is the leading cause of tooth loss in the United States. Although gum disease is not curable, it is controllable with the proper treatment. At South Shore Dental Care, Drs. Stutman and their staff provide scaling and root planing. Scaling completely removes the plaque and tartar that led to your gum disease in the first place. Then, root planing smoothes the root surfaces of your teeth so that both plaque and tartar are less likely to reattach in the future. If you are seeing any of the signs of gum disease we mentioned above, don’t wait for your symptoms to worsen. Contact our office to schedule your appointment today!